Samuel T. Gason was another one of the many interesting and colourful settlers of the Flinders Ranges. Gason joined the South Australian Police force on 2 February 1865 at the age of twenty three. Stationed at Lake Hope he had to try to keep the peace between the Aborigines, Missionaries and graziers. He must have done well according to his superiors for on 1 December 1866 he was promoted to Mounted Constable Second class. During his time at Lake Hope he often had to deal with the Aborigines who were stealing sheep from local graziers. On 31 January 1868 Gason arrested Perigundi Sambo for stealing two sheep from R. and J. Milner of Boolcaltaninna Station. On 21 June he again arrested some Aborigines. This time Harryboy and Paddy from Kopperamanna had "stolen three cows" from Mr Dean and Hack. After they had a good feast, Gason discharged them. Gason reported regularly to his immediate superiors and the government on the local conditions and particularly the local Aborigines. On 5 December 1869 he protested about the apparent closure of the police depot at Kopperamanna. He few months later he reported that all the flour there had been distributed. In June he reported a heavy flood and the loss of 17 Natives. In December 1870 he asked to be transferred to another location. On 1 August 1871 Gason was promoted to Mounted Constable First class. After his promotion Gason was transferred to Barrow Creek, in the Northern Territory, where even more problems were encountered between Aborigines and white settlers. On 22 February Gason cabled to Adelaide from the Barrow Creek Telegraph station: This station has been attacked by natives at 8. Stapleton has been mortally wounded, one of the men, named John Frank, just died from wounds. Civilized Native boy has had 3 spear wounds. Mr Flint, assistant Operator, one spear wound in leg, not serious. Full particulars in morning. Second attack expected. Gason continued to serve the force well in the north until 10 April 1876, when he resigned and settled at Beltana. Here he went into partnership with George Edward Curnow to run the brewery and Beltana Hotel. In August 1878 business was booming and Gason had to extent his hotel. The partnership was dissolved in May 1879 but Gason kept the hotel. Having settled in as publican and owner of the Beltana Hotel he now looked for a different kind of partner. He found a very suitable one and married her. In 1881, his wife Jane, presented him with a daughter, Emily Margaret. Jane would have had an extremely busy life caring for the little girl and doing the cleaning and cooking, not only for her family, but also for the hotel. Sadly Emily lived only about three weeks, when she died and was buried at the Beltana cemetery on 18 May 1881. 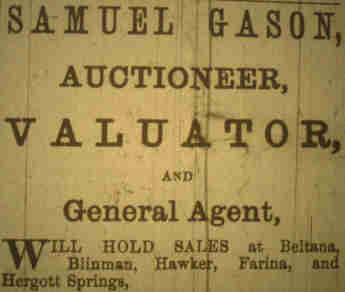 In 1884 Gason tried a different line of business. Some years later Jane was still working hard and doing a good job even while pregnant. One satisfied traveller wrote later "We must not begrudge the few moments at Beltana Railway Station, taking into consideration the splendid turn out which meet you at Beltana at Sam Gason's". On 29 July 1885 Samuel and Jane had another daughter, named Beatrice Ann. During 1886 Gason acquired the other hotel in Beltana. For a while it seemed as if years of hard work finally would pay off for the Gason family. Unfortunately this was not to be the case. On 29 March 1887 Jane died, aged only twenty-four. Gason not only lost a loving wife, but also a very efficient helpmate. He closed his newly acquired Royal Victoria Hotel and sold it later to Felix Montgomery Buttfield. During this time Gason also resigned as a member of the Board of Advice for the school district of Beltana. By the end of 1887 he was broke and had moved to Port Augusta. During his long stay in Beltana, Gason had been involved in both its social and business life. He was particularly interested in mining, had taken out several mineral claims and been on the board of directors of several mining and smelting companies. He had also collected many priceless mineral specimens for his own private museum which was visited by many people, including the local newspaper reporter who stated, 'Being a casual traveller in the North, I had occasion recently to put up at the Royal Victoria Hotel, Beltana. The genial proprietor, Mr S. Gason, not only made my stay agreeable and enjoyable by attending to my wants and requirements, in true hospitable fashion, but provided me with a special treat in the shape of a look at his famous museum'. 'But let me describe this last item of my host's accommodatory programme. First of all I was ushered into a spacious and well furnished apartment, on one side of which there stood a handsome mahogany case with sliding panels, mounted on a chiffonier. The contents of this piece of furniture I shall endeavour to describe. First of all my attention was directed to a beautiful Roman cameo shell, upon which was carved in small characters the "Lord's Prayer". Next I was shown, in due order, portions of a petrified lguana's tail, embedded in limestone, found near the Parachilna Gorge; some splendid gold specimens from New South Wales, Queensland, and our own Northern gold field Angepena; samples of asbestos in its natural and manufactured state; some very rare specimens of copper from South Australia, carrying from 15 percent to pure native ore. Some of these latter were finely crystallized, and many of them have been collected from the mines in the Flinders Ranges. Some beautiful samples of malachite from the Burra mine, sheets of mica from the McDonnell Ranges, very rich specimens of silver kaolin, chlorites, galena, and native silvers, many of them in crystallized form were also noticeable. Among the last were some from Ediacara and the surrounding silver fields, one piece of ore from the former carrying several thousand ounces to the ton, being worth particularizing. It is a really splendid specimen. A large assortment of Australian rubies showing very fine colour came in for inspection next, and then some grand magnetic and hematite iron ore, thousands of tons of which I was informed could be got within a few miles of the hotel. What would some of our world famed iron manufacturers, (Krupp of Essen for instance) give to be in such close proximity to so valuable a store? But to resume - petrified mussell shells, samples of the coal and shale from the Leigh's Creek coal fields, portions of the coal showing the various places through which the diamond drill bored, and other interesting mementos of the South Australian coal field, were all examined with interest. The petrified toe-nail of what evidently must have been a gigantic black-fellow unearthed by a miner while prospecting for the precious metal near Mount Ogilvie, surprised me not a little, as did also some specimens of cobalt found near the Blinman, some fine samples of nickel in crystal form, beautiful coral specimens, also a portion of a tooth of the large animal lately found on the shore of Lake Eyre, a large variety of most deadly and repulsive looking insects, snakes of all descriptions and numerous other ugly looking brutes, preserved in spirits, were all reviewed. In conclusion let me remark that so valuable a collection would put many of those seen in our public institutions in the shade, and will well repay a visit of inspection. Samuel Gason eventually returned to Beltana, but like so many had done during the depressed years of the 1890s, he finally left the far north and moved to a small settlement called Gibson's Camp, in the North West of South Australia. Here he became once more involved in the hotel business. He did not really get the chance to make the kind of contribution to this settlement that he had made to Beltana as he died on 11 April 1897. He was buried by Mounted Constable Buttfield at Gibson's Camp. A few days later the Adelaide newspaper published this obituary. The announcement of the death of Mr Samuel Gason will be received with deep regret, especially amongst those who are acquainted with the history of the far northern portion of the colony. Mr Gason, who was fifty-two years of age, died very suddenly at Gibson's Camp, about fifty miles from Port Augusta, during Saturday night, having been found dead in his bed on Sunday morning. Mr Gason joined the mounted police on February 2nd, 1865, and after having been connected with the force for a little over eleven years, during which time he saw very active service amongst the natives of Cooper's Creek, Barrow Creek, and several other stations in the Far North, he retired on April 30th, 1876. Perhaps the most memorable incident connected with his career as a police trooper took place while he was stationed at Barrow Creek, and the occurrence will be the more painfully remembered for it was then that the life of a promising young telegraph operator, Mr Stapleton, was cut short. The men at the station were seated at the back of the building one Sunday evening, when they were surprised by a party of blacks armed with spears and waddies, and before they could secure their position Mr Stapleton and one of the black boys were speared. Mr Gason rushed around to the entrance of the building, where he found about fifty natives gathered. He fired several shots, and scattered the blacks, and it was owing mainly to his gallantry that the lives of the rest of the men were saved. While he was at Barrow Creek the natives were very troublesome, giving the police plenty of work, and on more than one occasion did the officer distinguish himself. At the banquet given to the late Commissioner Hamilton on his retirement, that gentleman referred in grateful terms to the conduct of Mr Gason at Barrow Creek, commenting on his bravery in the brush with the blacks in which Mr Stapleton lost his life. Mr Gason thoroughly understood the language of the natives, and was conversant with their manners and customs. A book written by him on the Diery tribe embracing an account of the character of the race, the country, its inhabitants, its rites, ceremonies and superstitions, its social usages and laws, and the diseases peculiar to it, was published by the Government in 1871. This affords interesting reading, and shows the author to have been a very keen observer of that particular tribe. Further, the catalogue of animals, plants, weapons, and ornaments, with their native names, together with examples of the construction of the dialect and a complete vocabulary, gives valuable information concerning a race fast dying out. On retiring from active service, Mr Gason went into the hotel business at Beltana, where he resided for some years. He then journeyed to Gibsons' where he took another hotel, and remained there till the time of his death. Mr Gason was a native of Adelaide and spent the whole of his life in the colony. Almost immediately after his death, the locals established the Samuel Gason Memorial Fund. It received many small and large contributions, including $3. from F.M. Buttfield. The money was used for a tombstone with the remainder handed over to his daughters.